Let's analyze Baskonia's last games. Welcome back to Corner Stats! As I already mentioned last week, Baskonia, despite the latest injuries, is winning important matches in the fight for a playoffs spot. For the Basque team, it would be an important goal to reach the playoffs again, also because the Final 4 will be played in Vitoria. Let’s analyze the last games of Perasovic’s team. 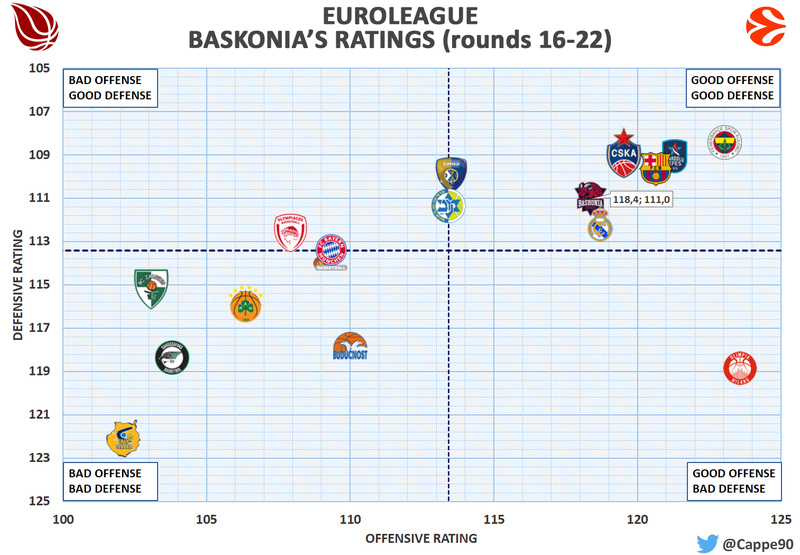 As you can easily see, Baskonia in the last rounds is among the best of EuroLeague, which is not so obvious given the aforementioned injuries. This positive effort can be explained by several factors: the most important are Luca Vildoza‘s final explosion and Voigtmann‘s comeback. The Argentine guard’s minutes have increased after Granger’s injury from 18 to 26 minutes per game. The player has responded very well: his PER has gone from 15 to 17, thus showing how Luca has increased his global contribution. With Luca on the court, the Baskonia’s Net Rating is firmly positive, which passes to a negative value while the player is on the bench. Looking at the individual numbers of the last games, the team Net Ratings with Vildoza on the court (excluding the game against the Darussafaka) are always positive, which is not always the case for his teammate, Huertas. The other factor, as I said before, is Voigtmann. The big man has finally found again his hand from the 3-point range and his self-confidence that had been partially lost in the first part of the season. Since the 16th round is shooting with a 43% from beyond the arch with about 4 attempts per game. His offensive performance, therefore, has increased from 106 points per 100 possessions to 120, a much more positive value than the previous one. So even the new arrivals like Shields and Hillard have improved their productions guided by Vildoza, Poirier and the other players of the last season. Currently, the Baskonia is showing several flashes that recall the past season: Perasovic’s team now has as its main goal to collect as much as possible, given that the last three matches will be very tough: Real, Efes and CSKA. 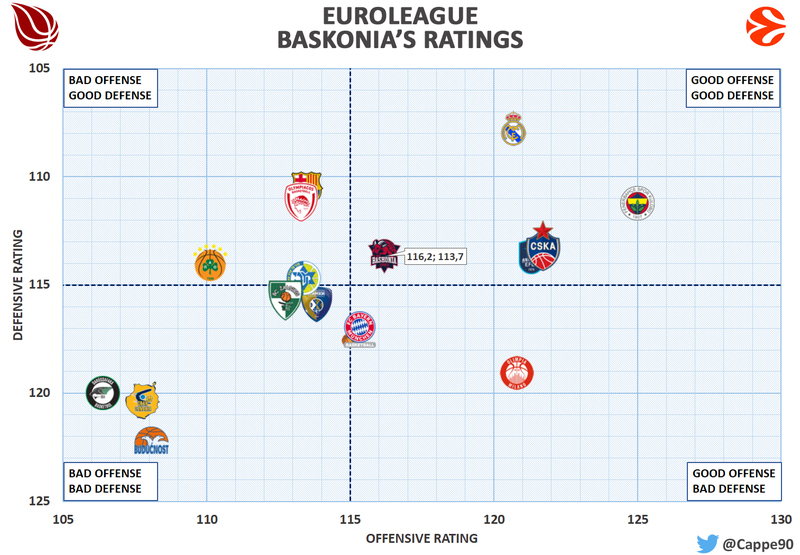 The race for the eighth place between Baskonia, Milan, and Bayern will be so much fun.